Shady forests, wooded areas, urban parks, wetlands, and gardens. Half-black bumble bee is a common, small, colonial, ground-nesting bumble bee. The female (worker) bee is ¼″ to ⅝″ long. The head, thorax, and abdomen are densely covered with relatively long hairs. The upperside of the thorax is mostly covered with yellow hairs except for a small, round, black, bare spot in the middle that is more or less fringed with short black hairs. There are six abdominal segments. The first two are densely covered with yellow hairs. On segment 2 the yellow portion is occasionally narrowed slightly in the middle rear (apically) with black hairs. Segments 3 through 6 are entirely black. The hairs on the head are mostly black but there is a dense tuft of yellowish hairs at the top (vertex). There are two large compound eyes, one on each side of the head; and three small simple eyes (ocelli) in a triangular pattern at the top of the head between the compound eyes. The middle ocellus is larger than the the two lateral ones. The top of the small (lateral) ocelli are on a virtual line (supraorbital line) with the top of the compound eyes. There are long black hairs and a few shorter pale hairs around the base of the antennae. The antennae have 12 segments. The first antenna segment is longer than the second or third, but shorter than the two combined. The space below the compound eye (malar space) corresponding to the cheek, is longer than wide. The hardened plate above the upper lip (clypeus) is smooth, shiny, and swollen. The tongue is medium-length. The wings are lightly brownish tinged. with brown to dull brick red. The legs are often reddish. The queen is similar but larger. The male (drone) is similar but has 7 abdominal segments and 13 antennae segments. Abdominal segments 3 through 7 are black but with evident yellow hairs at the margins. 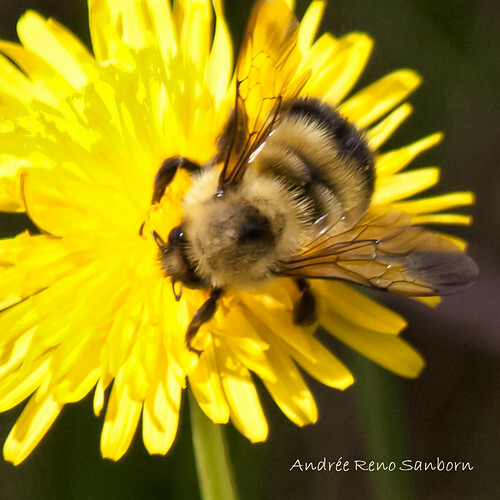 Sanderson’s bumble bee (Bombus sandersoni) hairs on the top of the head are black. The malar space is square, as wide as long. There are a few yellow hairs on the fifth abdominal segment. The black spot on the upper thorax may be absent or unclear. Overwintering queens emerge from hibernation in May. They build nests mostly underground but sometimes on the surface of the ground or in hollow trees. On insects, a hardened plate on the face above the upper lip (labrum). In Hymenoptera, the space, equivalent to the cheek, between the bottom of the compound eye and the base of the mandible. The Bull Thistle is alive with bees of all kinds!